Not as eye-catching as many of its relatives, this lovely protea has hairy, black and cream-white flowerheads that peek out through the dense foliage like shy animals. Protea lepidocarpodendron is an upright shrub 2-3 m tall, densely bushy and well-branched from a single main stem. The leaves are upward-pointing and narrowly oblong, hairless when mature with a prominent horny margin, and they are sessile, i.e. they have no stalk. The Protea flower is not a flower, but a flowerhead or inflorescence, made up of many individual flowers grouped together on a rounded base or receptacle. What look like the 'petals' of the protea 'flower' are modified leaves known as floral or involucral bracts. Look inside the cup of bracts and you'll see many long narrow flowers massed together in the centre. Protea lepidocarpodendron flowerheads are oblong 90-110 mm long x 50-60 mm wide, often concealed by the leaves. There are 5-6 rows of floral bracts. 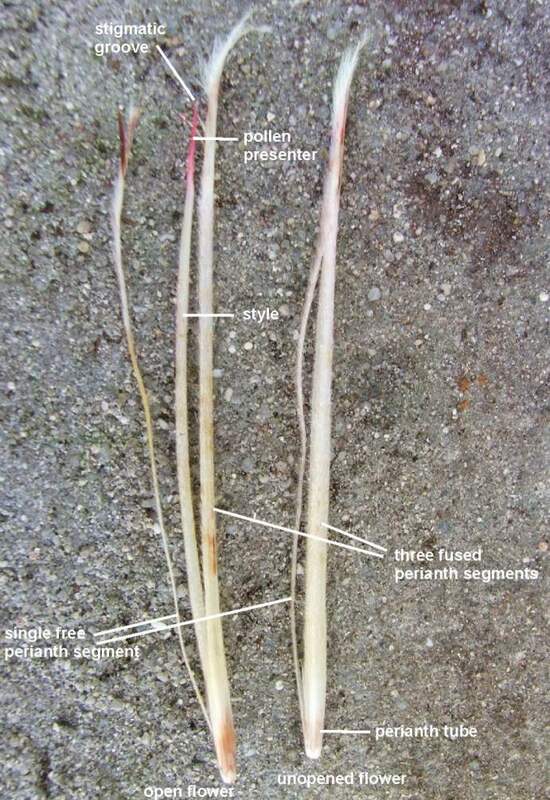 The outer series (seen on the lower part of the flowerhead) are brown, ovate with pointed tips and their outer surfaces are densely covered with silvery close pressed straight hairs and the margins are thickly fringed with long. white hairs. The inner series are usually creamy white, occasionally pink, oblong to linear with broadly spoon-shaped to rounded tips. They are densely covered in close pressed, purple black hairs from the tips to 20-30 mm down the outer surface of the bracts becoming sparse and silvery towards the base. The margins are fringed with long white and black hairs. The pelt of hair covering the tips of the floral bracts is known as the beard. 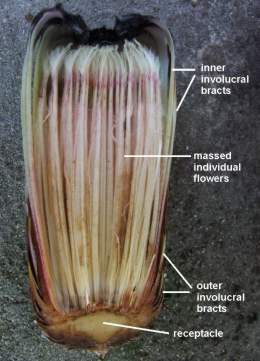 When you look inside a newly opened flowerhead, the flowers are tightly bunched together coming to a point in the centre. The flowers open from the outside towards the middle, and as they open, the central mass loosens up and the flowers fluff out. The tips of the perianth segments are also fringed with long creamy-white hairs, and don't fall away when the flower opens but remain upright, concealing the style. Flowering takes place in late autumn and winter, April to August, peaking in June. The fruit is a small dry hairy nut. Seeds are held inside the flower until the branch, or bush, dies. For harvesting purposes, the seeds should be left on the bush to ripen for a period of about seven months. Only a few viable seeds are produced per head. This species is occasionally confused with Protea neriifolia. 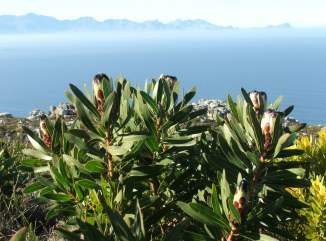 At one stage, P. neriifolia was mistakenly thought to grow on the Peninsula based on an incorrect identification of a pink variant of P. lepidocarpodendron collected in Platteklip Gorge on Table Mountain . If in doubt, take a closer look at the outer surfaces of the upper part of the inner involucral bracts - in P. lepidocarpodendron they are covered in purple-black downy hair. P. neriifolia has fine silver hairs below the beard. An even easier way to tell them apart is to look at the outer series of floral bracts, i.e. those that are lower down on the flowerhead. In P. lepidocarpodendron they are brown while the inner (higher) ones are white or pink. In P. neriifolia they are all the same colour. Protea lepidocarpodendron is Near Threatened, i.e. it is likely to be threatened with extinction in the wild in the near future. It has lost approximately 30% of its habitat over the past 60 years to property developments, roads and alien plants. A new and equally serious threat to this species is hybridisation with Protea neriifolia, P. burchellii and P. laurifolia . 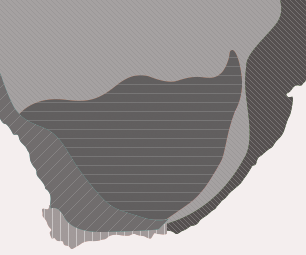 In nature their distribution ranges don't overlap but people have cultivated them and planted them in places where they previously did not occur. Now hybrids between these species have been seen growing in natural areas. The extent of this threat is still uncertain, but if these hybrids set viable seed and continue to breed with the pure species, the species will be permanently altered, even wiped out. 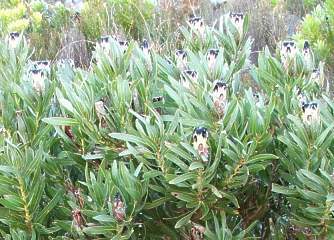 People that live in the natural distribution range of P. lepidocarpodendron, particularly those that live within 1km of a wild area, should not plant P. neriifolia, P. burchellii or P. laurifolia in their gardens. Likewise if you live in the natural range of one of the other three, don't plant P. lepidocarpodendron. Protea lepidocarpodendron is endemic to the Western Cape, in a narrow distribution range from the Cape Peninsula along the False Bay coast to Stanford, near Hermanus. It is most abundant on the Cape Peninsula where it is fairly common on the lower slopes from Lion's Head to Cape Point. It can also be seen on Groenlandberg near Houwhoek, in the Kogelberg and along the coast at Rooi Els, Betty's Bay and Kleinmond to the Klein River mountains with the most easterly population between Vogelgat and Stanford. This protea is always found growing within 20 km of the coast, almost always in dense stands between sea-level and 300 m, occasionally as high as 600 m. It grows on the north and south slopes, most often on the edges of damp kloofs, near seepage areas and on sheltered slopes. It is found on granite-derived soils as well as Table Mountain Sandstone-derived soils but its most favoured position is in the clay soils formed where shale bands are exposed. The genus Protea was named in 1735 by Linnaeus after the Greek god Proteus who could change his form at will, because the proteas are so different in form. The species name lepidocarpodendron means 'tree with scaly fruit', from the Greek lepis a scale, karpos a fruit and dendron a tree. The Proteaceae is an ancient family. Its ancestors grew in Gondwanaland, 300 million years ago. The family is divided into two sub-families; the Proteoideae, best represented in southern Africa, and the Grevilleoideae, concentrated in Australia and South America and the other smaller segments of Gondwanaland that are now part of eastern Asia. Africa shares only one genus with Madagascar , while South America and Australia share many common genera - this indicates that they broke away from Africa before they broke apart from each other. In Africa , no species occurs further north than the Limpopo River, and 92% of the species occur only in the Cape Floristic Region, a narrow belt of mountainous coastal land from Clanwilliam to Grahamstown. The extraordinary richness and diversity of species characteristic of the Cape Flora is thought to be caused in part by the diverse landscape where populations can become isolated from each other and in time develop into separate species. Protea lepidocarpodendron was one of the first proteas to be grown and flowered in Europe. It was collected by Francis Masson and introduced to the Royal Botanic Gardens, Kew in 1786 and was soon growing in most European protea collections. 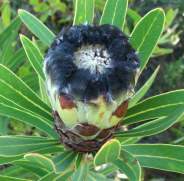 Protea lepidocarpodendron and all the other species that are not bowl-shaped and nodding, have the same pollinators and pollination mechanism. When a protea flower is still in bud, the anthers release their pollen onto a structure on the tip of the style called the pollen presenter. To avoid self-pollination, the stigmatic groove on the pollen presenter i.e. the surface on the stigma that is fertilised by pollen, stays closed and unreceptive until the pollen that was deposited by its own anthers has been removed from the pollen presenter. When the flower opens, the style, and pollen presenter, is exposed. The pollen is removed and then deposited on the pollen presenter of a different flower by the Sugarbird ( Promerops cafer ) and the Protea Beetle ( Trichostetha fascicularis ). Sugarbirds feed on the nectar produced by the flower - it is found in the perianth tube at the base of each flower. They perch on the flowerhead and push their head and beak through the styles to reach the nectar. 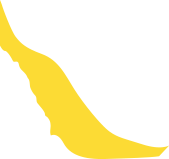 While doing this, the pollen on the pollen presenter is transferred to an area between the bird's eyes. When it flies off to another flower, it transfers that pollen to the pollen presenter of a different flower. Protea beetles also visit protea flowers to feed on the nectar. It is large enough to brush pollen onto its body and redeposit it while it moves around in the flowerheads. Sunbirds also visit protea flowers to feed on the nectar, but they have shorter beaks than the sugarbirds, and feed in a different way, sticking their heads down the side of the flower to reach the nectar, missing the pollen presenters and probably not aiding pollination in any way. Many other insects visit protea flowerheads - turn one upside down and tap the side a few times and see how many fall out. Some are pests, damaging the flower or eating the seed, but most are there to feed on the pollen or each other and may also be extra food for sugarbirds and sunbirds. Protea lepidocarpodendron seeds are stored in the old flowerheads on the plant, so seed is saved up over many years forming an aerial seed bank - this is called serotiny. When the bush is killed by fire the seeds are released and many new plants sprout from the seeds, recolonising the area as quickly as possible. This strategy is not perfect, and a population can be wiped out if a fire happens too soon after a previous one, before the plants have built up a new seed bank. Similarly, if the fire happens too early, say in spring, the seeds lie exposed to predators and the elements for months before the autumn rains, with the result that fewer will survive to germinate. If the bush dies from old age or disease etc, or if an individual branch on a thriving plant dies it too will release its seeds. 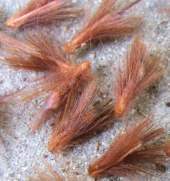 The hairs on the seeds aid in dispersal and germination: by expanding as the flowerhead opens, forcing them out of the head; once they are out, the hairs allow the seeds to be more easily moved by the wind; and once they land on the soil the hairs help to anchor the seed to the ground; and finally, the hairs help orientate the seed the right way round and channel water towards it. Protea lepidocarpodendron is an excellent, long-lasting cutflower, and its unusual furry black and white appearance adds interest to any arrangement. Leaves start to blacken after about a week in the vase, but the flowers continue to look good for many weeks. Stripping the leaves solves the problem and exposes the lovely flowerheads. This vigorous, adaptable protea is easily grown in most well-drained garden soils, but prefers acidic soils (pH7). Plant it in a sunny position, where there is free circulation of air, in well-drained acidic soil, preferably on a slope, and water well throughout the year but particularly in autumn-winter-spring. Don't make the mistake of thinking that proteas don't need water. It is important that they receive enough water, but that the excess water drains away as proteas soon die in stagnant waterlogged soil. Keep root disturbance to a minimum - protea roots are very susceptible to infection so try not to break them by digging around their base inside their drip-line, rather put down a thick layer of mulch once or twice a year and leave them undisturbed. Proteas are very light feeders with sensitive root systems that are adapted to very nutrient-poor soils and will be killed by strong fertilisers and manure. Proteas don't like phosphates (P), so choose a fertiliser that has little or no P in its formula, and give them small doses more frequently, or use a slow-release fertiliser. This protea is tolerant of summer drought, but grows better with regular watering throughout the year. It is wind-tolerant, even of salt-laden winds, which makes it perfect for coastal gardens. It is not frost-tolerant and is thus not suited to frosty gardens. Being fast-growing, this protea will soon get leggy and overgrown and is best replaced every 8-10 years. Protea lepidocarpodendron is easily raised from seed, sown in autumn, in well-drained soil, lightly covered with clean sand or fine-milled bark and kept moist but not wet. Germination occurs after about 30 days. 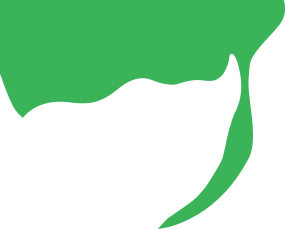 Treating the seed with a fungicide increases the number of surviving seedlings. Transplant into individual containers as soon as the first pair of true leaves have developed. The first flowers can be expected in its third year. It can also be propagated by semi-hardwood cuttings taken from the current season's growth, in autumn or spring. Remove the leaves from the basal third of the cutting, treat with a rooting hormone, and place in well-drained rooting medium under intermittent mist with bottom heat of 25° C.
Rebelo, Tony. 2001. Proteas , A Field Guide to the Proteas of Southern Africa , 2nd Edition . Fernwood Press, Cape Town. Rourke, John P. 1982. The Proteas of Southern Africa. Centaur Publishers, Johannesburg. Vogts, Marie. 1982. South Africa's Proteaceae, Know them and grow them . Struik Publishers, Cape Town.